Balance is a good thing unless you are sitting on a see-saw and want to get off! On Monday, March 20, both day and night were about the same length around the globe. People in the northern hemisphere experienced the spring equinox. Those in the southern hemisphere have moved slowly toward fall. The Express News from the United Kingdom reminded readers what such an astronomical change means: that the sun has crossed the celestial equator, the projection of the Earth’s equator into space. I like to live a life in balance, but at times my life feels turned upside down. Here’s a quote from my diary written in long-hand long ago . . .
What’s so awful about the world being turned upside down? If it were, we’d be walking on clouds! Fiction writer Anne Enright writes about the winter solstice with a page from her past (The New Yorker, March 13, 2017). I don’t like my world turned upside down and I suspect you don’t either. How did you respond to the recent time change? What else throws your life out of balance? Tips for keeping yourself in balance? All comments welcome, even your plans for a spring garden. Ah, what a happy thought! Boom! You have started us off with what I guess is a contrasting viewpoint. As a career woman, you must enjoy being greeted by sunny skies not dusk when you leave your job in the afternoon hours. I think you have a published book in your hands because you followed a strict routine. Brava! Interruptions make me cranky too. I hate being unbalanced, but I liked your comment about walking on the clouds. That’s a positive spin. And sometimes, I suppose we all need to be turned upside down. But the time change? Ugh. I wish we’d either stay on DST or Standard. I don’t adjust well. We are such awful gardeners, but we’re trying to plan a bit. 🙂 We just bought a gazebo. It’s still in the box, but I’m hoping it will let us sit in our large, but buggy yard this summer. Why not let your daughters and their spouses set up the gazebo. You could provide the treats and vino after they finish – which would fuel them and another Monday Morning Musing! Good one, Marian. I’m particularly impressed that you’ve written an entire post about life being out of whack (upside down) without once naming hewhoshallnotbenaned. Congratulations. For me, it’s not so much staying in constant balance. That see saw of life would be rather flatlined. It’s more about how much time goes by before I am in balance once again. Am I the one always initiating contact with my good friend? A friendship can withstand a certain amount of imbalance; but after awhile, I need reciprocity. Same with a marriage, of course. With our current political climate, I focus on what IS normal in my life, rather than what is not. And I work hard to turn my ship of state upright once again. Don’t get me started on that time change! I agree, Janet. The last year or so has brought us many opportunities to try to stay “steady in the boat.” We have no reliable sextant to chart our way through such upheavals. You have chosen a healthy perspective and have reminded me of my Word for 2017: Focus. You also mentioned initiating contact with a good friend. I recall a long-time friend who never called or wrote. I told myself I’ll try one more time. That one last effort saved our friendship. Retirement of one spouse or the other often throws one or the other out of sync. 🙂 Some of the changes are great. We each need to find our own space. Oh, Melodie, I can definitely relate. When Cliff traveled extensively we always had to re-negotiate our relationship. I had to be super strong while he was gone, and then when he returned we had to adjust to a two-person household. I predict you’ll find the happy medium since you probably both are working on adapting to the new normal. As a Libra I instinctively strive for balance in all things. I’m a disciple of the Marie Kondo books (Japanese art of decluttering) and now enjoy perfectly organized drawers with t-shirts folded in rows! PS: I can’t get past that mage of the teeter-totter. As a skinny child I was the lightest of any pair; always left high in the air, only to be tossed to the ground when the other child hopped off. I remember your commenting on the “Paring Down and Tidying Up” post last year. You deserve a gold star in your organization “book” with the follow-up you describe. 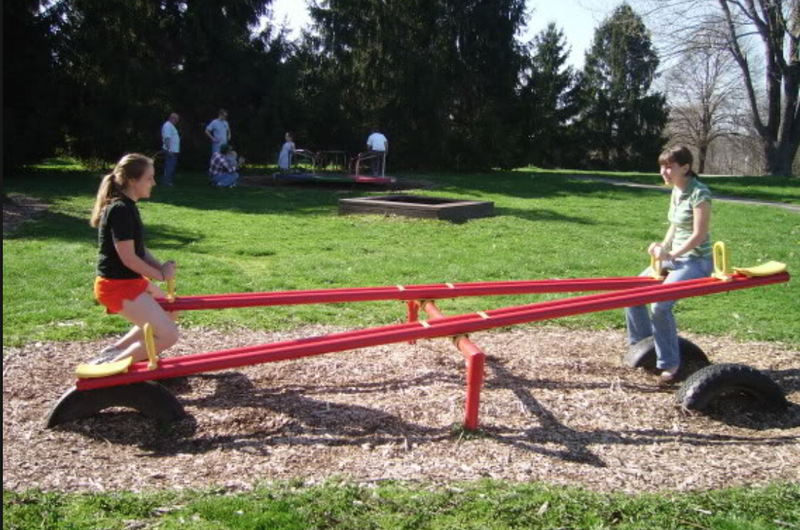 About the teeter-totter – I too remember the sensation of being popped into the air and maybe or maybe not being tossed off. We lived through it, didn’t we, Lynn. Thank you! Our clocks go back this weekend but I have noticed how light it is especially in the morning . I want to be part of your writing group, Cherry. Boy, do I need a dose of fun right now – primroses, grape hyacinths, ginger cake and other snacks would do the trick. Add a May Pole and I’m in heaven. You always cheer me up – and I suspect the same for other readers too. We don’t have DST time here in South Africa, though personally I think it would be a good idea for SA. From what I hear though, it takes some getting used to! We’re heading towards Autumn here – a chill in the mornings and evenings, though still bright sunny & warm during the day. Life has its upside moments for sure – sometimes more so at certain times … time then for me to be quiet and still to regain my balance. Quiet and still seems like a marvelous way to allow the fulcrum of our busy lives to regain balance. I suppose your autumn includes colorful foliage as we here in this hemisphere anticipate trees wit chartreuse shoots. Thank you, Susan. I am having trouble keeping my life balanced now that I am retired. I feel I was very good at it when I worked. Moving can certainly turn ones world upside down. I am one who enjoys the extra hour of sunlight and have no problem adjusting. I love your Quote! Thanks for noticing the quote, Darlene. I think it was originally written on a sticky note and then stuck to a journal. You know how that goes – ha! About adjusting to retirement: 6-8 hours of our days then were pre-determined, so we got into a certain rhythm. Now we have more choices but also more chances to get distracted. You are observant and upbeat, a winsome combination. Thank you for those kind words, Marian. I’m another who loves the extra hour of sunlight each evening, it makes it so much easier to go out at night, although I realize many don’t like getting up in the dark, but that will change soon enough. I wish ‘they’ would keep the clocks set this way year round. Happy spring! Thanks for following me here, Marcia. I think keeping the clocks set one way year round is the best solution as others have suggested too. Browsing your blog, I’ve discovered we have a mutual interest in the 9-12 age range, like those of my grandchildren. I’m glad to see you, Darlene and I have connected here. Again, welcome! Marian, the time change usually throws me for a mini-loop for a few days but I know to expect it and I’ve learned to go with the flow. As far as trying to maintain balance, I try not to focus on that idea. The harder I try , the more off-kilter I feel. Soooo…I figure if my good days outweigh my not-so-good days, I’m doing alright. Balance seems illusive to me. My mantra of “keep it simple” fits better. That way I’m not disappointed when perfect balance is not achieved. You know the saying “some days are diamonds, some days are coal”? Make sense? Somehow it all evens out. It works for me! We were visiting our children in Ontario when the time change occurred. They were already an hour ahead of us in Manitoba so that meant adjusting to a two hour change. I didn’t know how to reset my watch (it’s not an expensive watch, but it’s rather complicated to change the time on it), so I always had to add two hours to my time mentally. This gets pretty tricky at night when you wake up half drowsy and have to add two hours to figure out what time it is! It also leaves you thinking you have plenty of time when you don’t because you forgot to mentally add the two hour difference! Really, life is complicated enough already! You are telling it like it is, Elfrieda. And, “time waits on no man,” my mother used to say. That statement applies especially when you experience a 2-hour time leap. Eventually, we do adjust, a good thing. The see-saw of life I’m sure I know it so well. Just when I think all is well an under current comes and sweeps me off my feet. The blessing that I have is a large circle of friends family and my Lord that I tap into to keep me balanced. When confronted with something I can’t change or control I just stand and this to shall pass. Change of time doesn’t affect me. It’s change of circumstance that throws me. Looking forward to gardening. This year I plan to dig in. Enjoy your day. The see-saw of life can be jarring. I remember you describing your ups and downs with launching a family restaurant. I hope that things are sorting themselves out. Digging into gardening sounds like a great way to compensate for stress. I have been thinking about you lately and appreciate seeing you in this column today. Blessings, Gloria! I do like things to be in balance and somewhat routine. Having retired 4 months ago, I find myself still trying to find a new balance and routine and have to say that I do miss the routine of my “work” life. I have worked away from home all my life and this retirement business has upset my routine, but I am determined to find a new normal. We have traveled quite a bit since the end of February and the time change which usually hasn’t bothered me much, did this time. 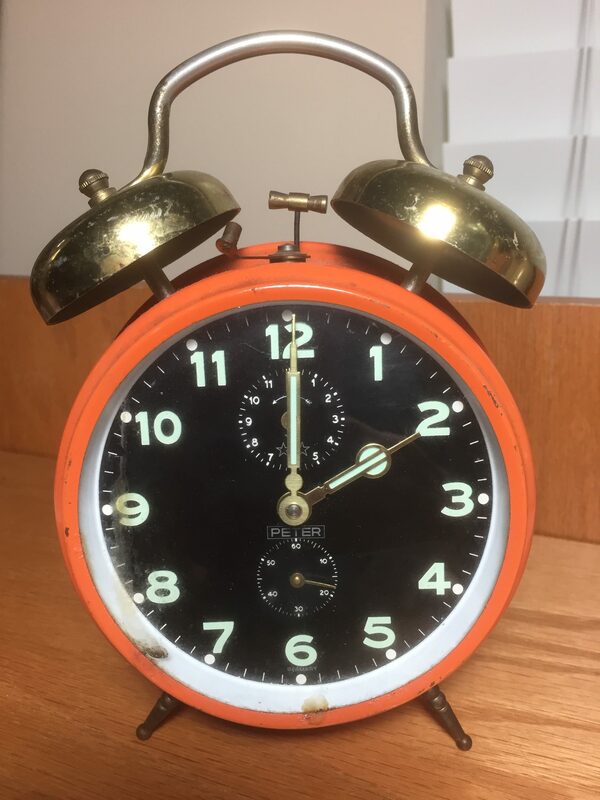 We went from the central time zone, to the eastern zone for about 10 days, back to central for 4 days, back to eastern, then the time change and then back home in the central time zone after another few days. Then we have had guests this week. I am longing for a return to whatever my routine is by this weekend. I also find the wild swings in the weather lately to be discombobulating. No, I’m not messed up at all. Why do you ask?! However, the little local ice cream shop has opened, spring is here, we are talking about getting our garden in and I’m stoked about all that! Welcome, Sarah, to this conversation. I sense resilience and humor in your comments here. Trust me, you will find a new rhythm, but that takes time. After 42 years in education, I found that I needed a year just to begin adjusting. I tried various things including learning French with Rosetta Stone and caught up with friendships I had neglected when I was in career mode. It sounds like plans for a garden will put a spring in your step. Do visit here again! Susan, I can picture you relaxed listening to the church bells and then tensing up as they struck nine. Gasp! Thank you for mentioning British Summer Time, a fact I did not know about till now. It’s always nice to see you and your trusty RV Gravatar photo here. The spring time change always throws me off balance and it usually takes me two weeks to recover. I am now. I thrive when my life is in balance and for a long time it was all about the book. Now I’m back to living in balance and loving it!! I’d say don’t let one thing take over your life. I picture you easing into spring in Charlottesville. I am enjoying daffodil fragrance at Aunt Ruthie’s house in PA.
Oh I wish we would leave the clocks alone! The change does throw me off balance and completely confuses our little Yorkie who wants her dinner when she wants it regardless of what the clock says! Just leave the clocks alone. I say Amen to that, Linda! I love your upside down clouds! I love the balance of the world and then the world tipping – one into light and the other into darkness… We in Europe change our clocks this weekend. Fiona, I believe you and Fatima (above) are on the same time schedule. I am sure you will take advantage of “the world tipping” in photos I’ll see on your website. Cheers to balance and what comes next! I love the extra hour of daylight just at a time when we could spend more time outdoors. I mean there was still snow and it’s still cold but there are just some spring farm chores nicer to do in the longer daylight. I totally dislike losing that hour of sleep and look forward to gaining it back in 6 months, but it all comes out in the wash. Isn’t that another way to say it all equals out? …no lasting damage?? Yes, indeed, Athanasia. It does all equal out and usually there’s no lasting damage. Spring on the farm must mean your land is mud-luscious as the days grow longer and warmer. Thanks for adding your perspective to our conversation here. When I re-discovered my cloud quote it struck me as saccharine, even hokey, but I kept it because it fit the theme. If you like it, that’s all that counts. And I’ll go with your view about the time change. Why fight what we can’t change – right? I’m still adjusting to the time change! I really love your cloud quote. A reminder not to fear change, but to look for the good and enjoy it. Totally not hokey. The cloud quote is not hokey – that’s settled! You have had dramatic time changes recently, traveling to and from Belize. I have enjoyed your trip notes, especially the wedding. Here in Phoenix we are three hours off kilter, staying only long enough to feel the time shift in our bodies coming and going. I don’t usually mind time zone changes too much. I have to remind myself that being just a bit off balance gives us a new perspective — just as your cloud fantasy gave you. As the world spins and tilts, making the necessary adjustments time-wise is small in the scheme of things. Thanks for the reminder, Shirley. You and Stuart really get around. I can see why a pet would be impractical. You have probably seen the Grand Canyon. Sedona too is lovely this time of year. Safe travels! Hi Marian. I just came back here directly to see if you replied to my comment. I don’t even see the comment here. Since you moved your blog, I’ve never had a reply from you? The time change did not affect me but since I am retired it probably just went by as no big deal!! As for having my world turned up side down, I hate it! I hate it esp. when it is done by others. I retired in July, my grandson moved in with me, my daughter moved in and 3 months later moved out and I had surgery. I will be so glad when my life becomes normal cause at this point, I am not sure how NORMAL RETIRED life is supposed to be! Love the pics flipped the wrong way, good thinking. Pam, the word bittersweet fits our lives now. As writers, we may appear cool and collected, our creativity flowing in published posts. But like others, life deals its curve-balls, throwing us off balance. Both aspects are authentic, like the duck gliding smoothly across the pond, webbed feet paddling madly. Nice BLOG!!! ADD my BLOG too!! Welcome, and thank you, Nilda. (I’m taking a wild guess that your first name is Nilda – ha!) I notice on your site that you have a keen fashion sense. As a Mennonite girl turned fancy, I love bright colors, red being a favorite. Thanks again. Do visit often. Plenty of other things knock me off balance. Traveling is one of those and I just spent nearly a week in NC. Where am I? The views outside say I’m back home. Then there are the constant issues that come up with my mother-in-law’s care, always requiring an adjustment of the health aides or how we handle her needs. Things settle for a few days and then we all fall down again. In mid April, my son and his partner are moving here. Now that’s a boat rocker… Stay tuned. Thanks for making a good excuse for me, Elaine, implying that my off-kilter response may be attributable to my living in the Sunshine State. When we visited Aunt Ruthie a few days ago, her last words were “You came in sunshine and you left in sunshine.” Her doctor’s Alzheimer’s diagnosis is becoming more and more implausible. So is her cardiologist’s prognosis in September: Only 3-4 months left! We are wondering about finances too but will continue her best care no matter what. I know you have been rocking back and forth about possible scenarios with your sons. Now I read one is moving to New Yawk! I’m no prophet, but I think this will be a good thing. Yay!